Axle is a steel shaft on which the locomotive wheels are mounted. The axle not only holds the wheels to gauge, but also transmits the load from the axle-boxes to the wheels. In some cases the axle is fixed in position with a bearing inside the hole in the wheel or gear to allow the wheel or gear to rotate around the axle. In other cases the wheel or gear may be fixed to the axle, with bearings provided at the mounting points where the axle is supported. Automobiles and other vehicles usually have a split axle, either front or rear. Each driven wheel is attached to a separate shaft, with a differential and universal joints between the two shafts and providing means to transfer power to the two half axles. The differential and split axle allows the two wheels to rotate at different speeds when the vehicle is turning. Transaxle - The most common type, which encases an automatic or manual transmission and a differential. The main purpose is the gear changing capabilities of a transmission. 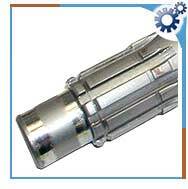 Drive Axle - Also called live axle, which contains the differentials. It provides the torque transfer capabilities of a differential. Straight Axle - A straight beam that connects the wheels together, but has no differentials. It helps to support the weight of the vehicle and serves as an attachment point for the wheels. Axle maintenance is related to the complexity of the axle. A straight axle requires periodic cleaning. Drive axles should have the axle lube level checked with every oil change. Positive lock differentials require a different lube. In cold weather synthetic lubes should be used because they flow easier in this weather. Axle lube is specially formulated oil that is capable of handling high-pressure loads. The lubricants come in various viscosities to meet different specifications. Axle lube provides lubrication for the various gears and bearings in the rear axle of rear-wheel-drive cars and trucks. Company Profile: Manufacturer of axle & drive shafts, adapters, plungers, seats, valve stems, suction valve chairs, dynamic separators & packing cups. Company Profile: ISO/TS 16949 &14001 certified custom manufacturer of axle, & propeller shafts for ships & boats. Company Profile: Axle shafts. Power transmission equipment. Obsolete, bearings, belting, chains, clutches, controls, gearboxes, motors, sheaves, sprockets, rollers. Company Profile: Machine/machine shop. Complete operations, start to finish. Fabrication, machining, cutting, burning, assembly, welding, forming, blasting, painting, sub-assembly. Company Profile: Small & medium sized crankshafts, eccentrics, heads, cylinders, rocker arms. Company Profile: Manufacturer & distributor of axles & shafts including pinion, boat propeller, pump, threaded & spline shafts for pump, marine, automotive & aircraft applications. Company Profile: Roll manufacturing division manufactures new & repairs most types of solid & fabricated rolls for the steel, textile & paper industries. Company Profile: Manufacturer of shafts in aluminum, brass, plastic, stainless steel, steel, cross holes, flats & grooves. Small & large quantities. Company Profile: Manufacturer, prototype to production machining from barstock or forged axles, CNC & conventional machining, turning & keying. Company Profile: Manufacturer of CNC, manual, 150" max, all metals, prototype to production, all materials. Short & long runs, design, engineering, on-time delivery. Company Profile: Specializing in complex precision machined components & assemblies. Capabilities include: turning, grinding, drilling, milling, honing, threading & in-house heat treating. QS 9000 & ISO 9002. Company Profile: Distributor of axle shafts. Company Profile: Manufacturer of steel. Company Profile: Distributor of power transmission equip. Company Profile: Manufacturer of axles & shafts. Company Profile: Manufacturer of coke & coal chemicals & galvanized steel. Company Profile: Manufacturer & service of truck & auto drive shafts. Company Profile: Distributor of new, used, surplus shafts.